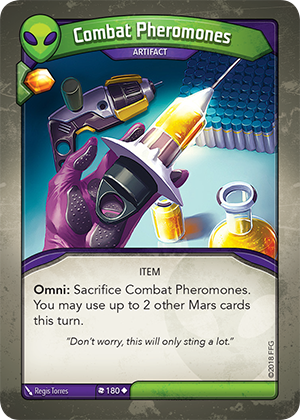 Card Text Omni: Sacrifice Combat Pheromones. You may use up to 2 other Mars cards this turn. Can I use the cards targeted by Combat Pheromones multiple times in a turn (if another effect readies them)? Yes. Combat Pheromones grants you permission to use those cards during this turn, without limitation on the number of times you can use them. When triggering the “Omni:” ability, can I choose to use less than 2 Mars cards? Yes. “Up to 2” means you can choose between 0, 1 or 2 Mars cards to use.